Usually cold, snowy February evenings do not warrant ice cream, but this incredibly simple and delicious banana ice cream recipe was screaming to be shared (You see what I did there: You scream, I scream, we all scream...yeah, I know. I will not do it again.). What I am trying to say is that, within 30 seconds your sad frozen bananas are transformed into a velvety delight. You can add any beloved flavorings to the whipped banana or eat it as is and enjoy immediately or store it in the freezer. I believe that when snow has been continuously falling, a little taste of summer is quite welcome at my house. I hope that you partake with me the enjoyment of watching the surprising process and savoring the sweet flavors of ice cream on a cold winter day. 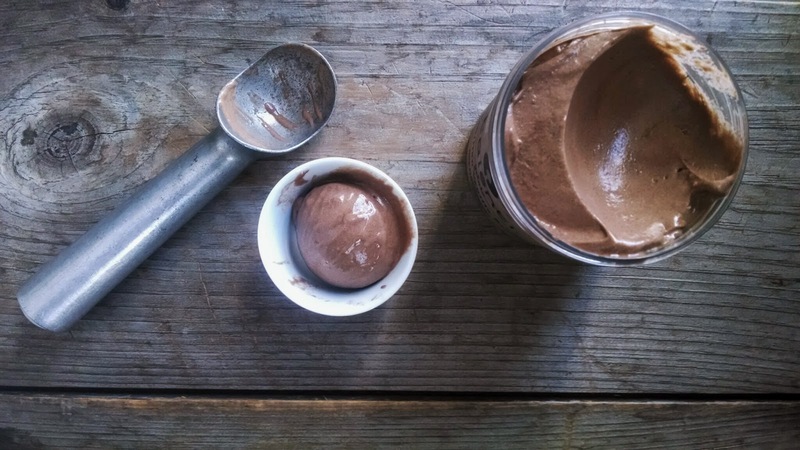 Chocolate & Banana Ice Cream. Add the frozen bananas into your food processor. Blitz for about 45-60 seconds (this makes a lot of noise at first, but do not be alarm!). At this point, the bananas should be fully blended into a smooth, creamy, and light frozen dessert. Add the cocoa, maple syrup, and vanilla. Pulse a few times to blend the ingredients. Be careful not to over-process or the friction from the processor will begin to melt the ice cream. You can enjoy this dessert right away for best results, but it will also freeze well for a day or two. Easy as that! Another blustery, winter day in Maine. Wind and snow gently tap against my window, then, like a dance, the flakes fall to the ground accumulating on the already mounting snow banks. It feels so long since Maine has seen this much snow at once: consistent and persistent. It brings me comforting and fond memories of living in the western Maine mountains. Even though I live in a little city now, the insurmountable snow brings me closer to the natural world and the joys of rural living. It's ideal to begain a chilly, snowy morning with a bowl of warming porridge. This grain-free almond based porridge is hearty, flavorful, and filling. Below I include a recipe that can last one through the week or enough mix for a family of four. This is a great basic mix for a sweet or savory breakfast. Depending on your palate, you can top your porridge with seasonal fruit and honey or stir in some grated cheddar and chopped scallions served with a fried egg on top. This is a versatile, protein packed breakfast that can be whipped up in 5 minutes. I love that- delicious food in a snap. As watch the snow, sip on my morning coffee and indulge in this bowl of satiating porridge, I feel intense gratitude for my warm home, full belly, and healthy and safe loved ones. I hope you join with me today in taking a moment to feel nourishment and gratitude. Add all the ingredients into a food processor. Blitz until the nuts and seeds are finely ground. At this point you can cook enough for 4 people or store the dry mixture. Recipe for 1 serving of carrot and raisin spiced almond porridge below. All the flavors of carrot cake, without the cake. In a pot, whisk the dry almond mixture, milk, carrots, 1 TBL maple syrup, raisins, cinnamon, and ginger over medium-high heat. Whisk the mixture frequently until it comes to a boil. Once it comes to a gentle boil, whisk and cook for about another minute. 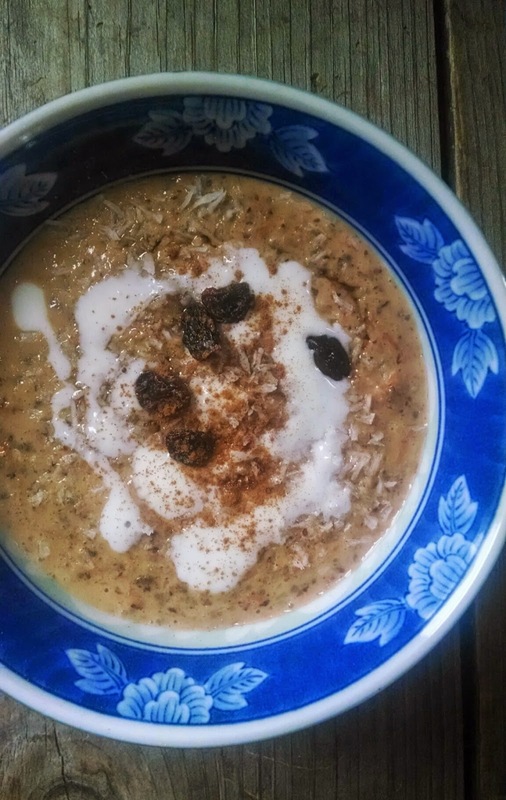 Pour into a bowl (it will thicken up a little more as it sits), add coconut, 1 TBL maple syrup, and a little more milk or yogurt, and if you want, a few more raisins and cinnamon to serve. Happy belated New Year. I hope everyone had a beautiful, relaxing holiday with friends and family, I know that I certainly did. For the past few weeks, I felt a bit off the grid and I admit that it has taken me quite a bit of time to gain energy back and find a routine again. Many of us create goals, formulate new habits, and make resolutions in the New Year, I have made a few as well. Since I now have job that requires me to sit many hours a day, I noticed a difference in my flexibility and feel stiffness in my joints and muscles. As a way to curb this detriment, I began doing Yoga in the morning, and have found that it is also a way to start a good habit and implement a beneficial morning routine. I have discovered that most days, I always have a 30-45 minutes to dedicate, and that I truly enjoy that time. What are some of your newest or most valued habits this year? As far as nutrition, I have been been cooking from the heart and for comfort. 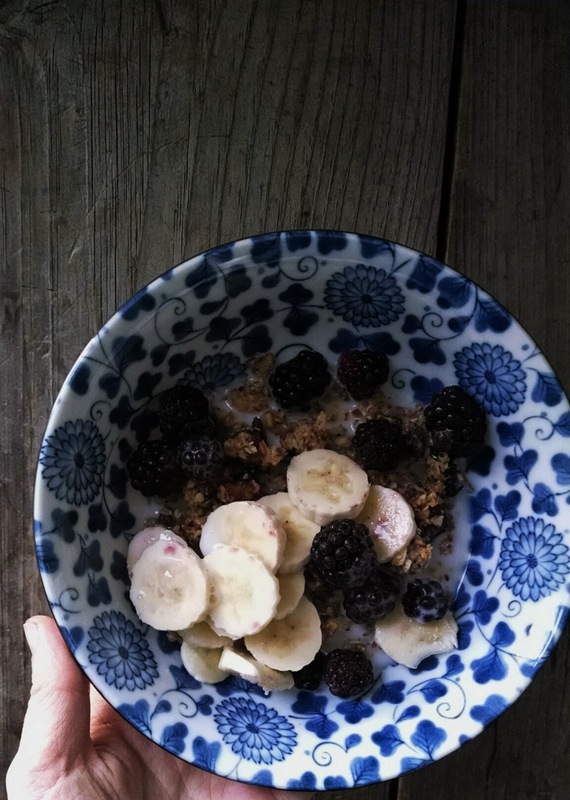 This is my 4th granola recipe on WE.H., but for good reason--I have finally devised a delicious grain-free granola. Before I adopted a grain-free diet, I ate granola almost every morning (hence the 3 previous granola recipes). This recipe has been a blessing for busy mornings as it is easy to pack up for the go and sustains me until lunch. I have been eating it with almond milk or kefir, bananas and berries. Nut, Seed, & Coconut Granola. Preheat the oven to 350 degrees F and line a baking sheet with parchment paper (or you can spray the baking sheet with oil). In a large bowl, whisk to combine oil, honey, cinnamon, vanilla, and salt. Add the nuts, seeds, and coconut to a food processor. Blitz until everything is coarsely ground. This will be reminiscent to the oat-like texture of granola. Add the nut, seed, and coconut mixture into the bowl with wet ingredients. Stir until everything is evenly coated and spread evenly over the parchment paper. Bake for 15-18 minutes, or until the nuts & seeds begin to turn golden; stir occasionally. Store in air tight container up to 3 weeks. *If you want the granola to be a little chunky & stuck together, pile the granola 1" thick to cool, then break apart. baked zucchini & potatoes. in mushroom-tomato sauce. honey & lavender almond meal muffins. khao man gai. & a walk along the sandy river. chicken salad. with apples & almonds. WE EAT. HAPPY. |. Simple theme. Powered by Blogger.